This Friday, March 25, marks what General Cigar is calling the “first-ever national virtual cigar tasting,” or more simply, Serie N Day. The event will be streamed live from the famous El Credito Cigar Factory in Miami and will feature an open forum chat between the members of Team La Gloria and select retailers. They will be taking questions via Facebook and Twitter at that time as well. 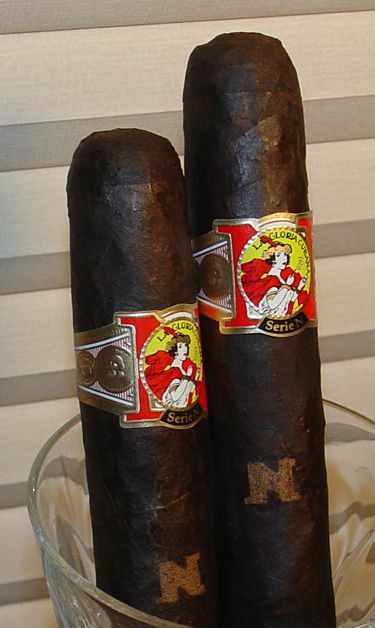 La Gloria’s Serie N cigar was designed as a medium-bodied counterpart to its well-known (and full-bodied) Serie R line. I have heard that the N, which is emblazoned on the barrel of each cigar using a lighter colored leaf, stands for Nicaragua. So naturally, the wrapper leaf is an Ecuadorian Sumatra. (Maybe the N stands for something else then. Maybe they’re Cornhusker fans?) On the other hand, the rest of the cigar is composed of Nicaraguan tobaccos proprietary to General, so the N stands vindicated after all. The Serie N was blended by Yuri Guillen, with the participation of the other members of the team: Benji Menendez, Michael Giannini, and Rick Rodriguez. The line is produced in the Dominican Republic and is presented in 24-count hexagonal boxes that are painted bright red with the Serie N logo in gold. The blenders call the Serie N wrapper “capa oscura,” and it’s easy to see why. It’s a shiny, nearly uniform black. There is just enough variation in the black tone to see that the processing of the leaf was done naturally. The roll is solid, though one sample I received had a dent in one side (I’m blaming the mailman) and the draw is excellent. The head is round, but the cap is not particularly admirable. It sort of looks like a massive cheroot (with an N on it.) The prelight scent of this cigar is sweet with a raisin-like note over the cured tobacco smell. The cap slices off neatly and even with a haphazard light the foot takes on an even burn. After ten or fifteen minutes of leisurely smoking the ash is solid and secure. The Serie N starts up surprisingly sweet and cedary, with an earthy hint of sulfur lurking in the background. At odds with this is a plummy note, or more specifically, a whiff of prune. The lowly prune has a somewhat checkered reputation, so I am reluctant to use that reference, but the nose doesn’t lie. (Though I admit it is sometimes mistaken.) The smoke is very smooth on the palate, but quite flavorful. After fifteen or twenty minutes’ smoking time, an acidic zing appears on the palate. The fruitiness fades and gives way to cocoa or chocolate flavors. It remains smooth and creamy on the palate, but picks up some spice on the nose. If you’re a retrohaler, you’ll find some exciting things going on here. In the last section a leathery base emerges with an overlay of chocolate and pepper. The spice seems to be almost entirely in the nose, not on the palate, where it remains quite smooth. 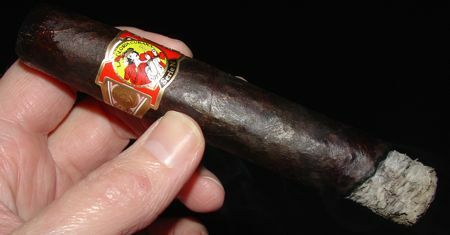 The Gloria Cubana Serie N isn’t billed as a maduro, but with its sweet chocolate cocoa profile I think it smokes like one. Add to this its initial cedar flavor, the fruity note, and the transition to leather at the end, and you have a maduro-style cigar with more complexity than your standard maduro. The Serie N is priced in the 6 to 7 USD range, which is eminently reasonable given its high quality. Light one up this Friday and enjoy Serie N Day with the folks at Team La Gloria. I doubt you’ll be disappointed.